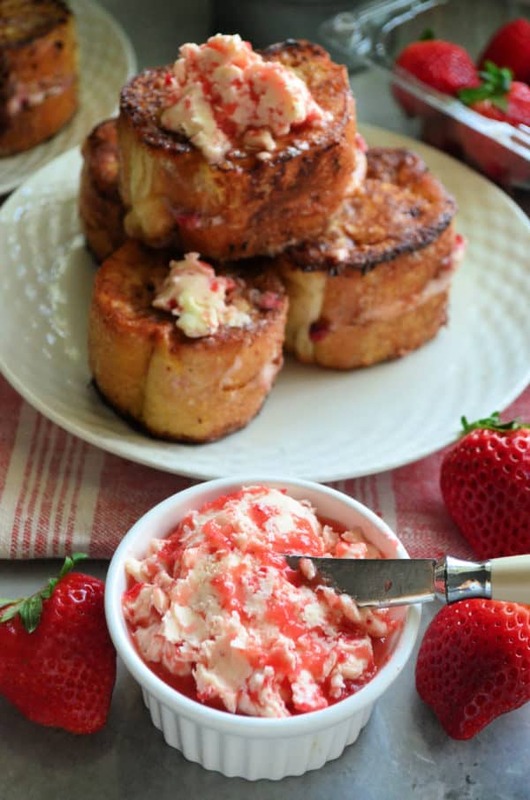 Amplify every day Butter with this three ingredient strawberry butter recipe. Perfect for toast, pancakes, waffles and more! Do you ever like to transform something simple, like butter and take it to the next level? I love making compound butters to amplify a juicy steak or jazz up a baked potato. But I always forgot about making sweet compound butters. Since it’s currently strawberry season here in Florida I’m buying 3 to 4 cartons of strawberries a week. Last weekend, I decided to make the most amazing strawberry cream cheese stuffed French toast (recipe coming later this week). 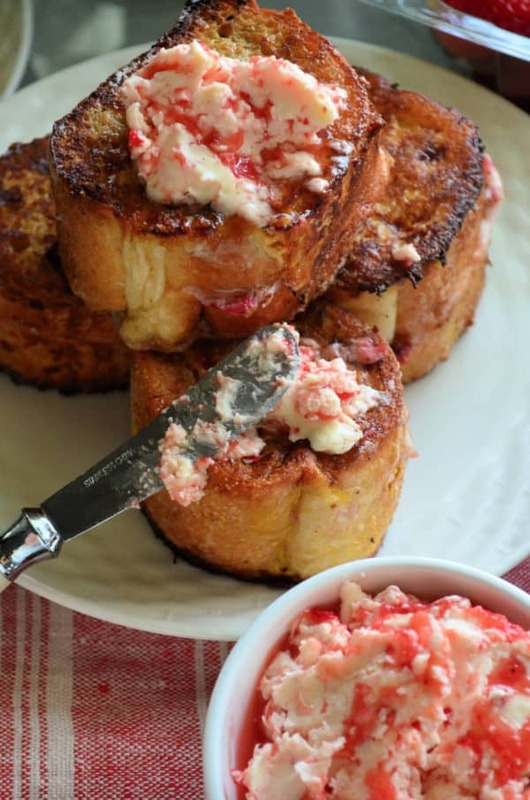 To complement that French toast I need this strawberry butter. As you can see in the pictures it melted and oozed on down the thick pieces of French toast giving an additional layer of flavor to my already delicious French toast recipe. 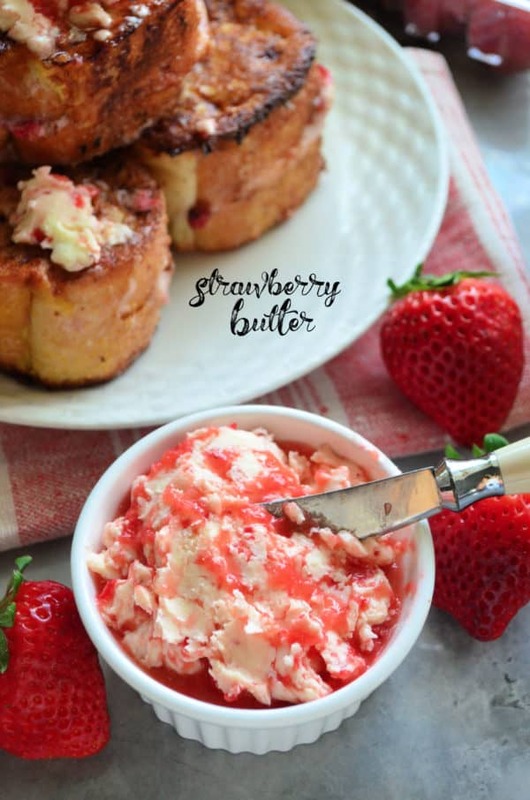 How do you make strawberry butter? First, you’ll need room temperature butter. Because this is a sweet recipe I like to use salted butter to balance the sweet verse salty flavor. However, you can totally use unsalted butter. The option is up to you! For the strawberry portion you can do one of two things. You can place a few strawberries in a food processor or finely mince the strawberries. If you don’t like the butter chunky you’ll want to purée it. I prefer it almost puréed. Next, once the stick of butter is at room temperature you’ll want to place in a KitchenAid stand mixer (or mix with a hand mixer). Then mix in some powdered sugar. Once it’s incorporated you’ll add in the strawberries. Mix until combined then transfer to a dish. Serve immediately or refrigerate for up to 5 days (covered). Can you freeze compound butter? Yes! If you don’t plan on having a brunch and using a full stick of butter the next best thing is to freeze the butter. You have multiple options for freezing. Option 1: place softened butter on plastic wrap and roll into a log. Option 2: Place the compound butter into silicone ice trays. Freeze for a few hours then remove from silicone trays and place in a freezer safe bag. Then you have individual servings whenever you need them. 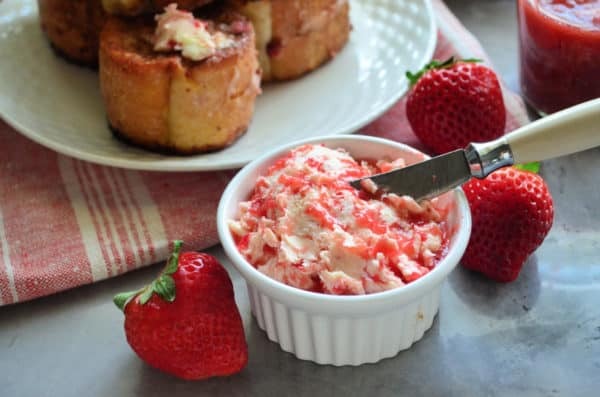 If you have a few extra strawberries and want to create your own strawberry butter I hope I’ve been able to give you the confidence to do just that. Making your own fruit compound butter is easy and delicious! Using a food processor finally meant the strawberries. Set to the side. Place that’s softened butter and a stand mixer fitted with a paddle attachment. Next together the butter and powdered sugar until well blended. Then add in the fresh strawberries. Mix for 30 seconds longer. Transfer to a ramekin and refrigerate until ready to serve. *You can freeze this butter for up to 3 months in a freezer bag.